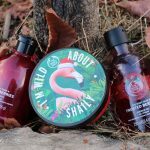 Till now I have been reviewing The Body Shop products meant for my skin or in other words for skin with no or minimal signs of aging. 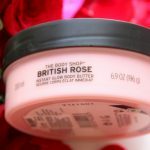 However, this time The Body Shop has launched a collection meant specifically for the mature skin. 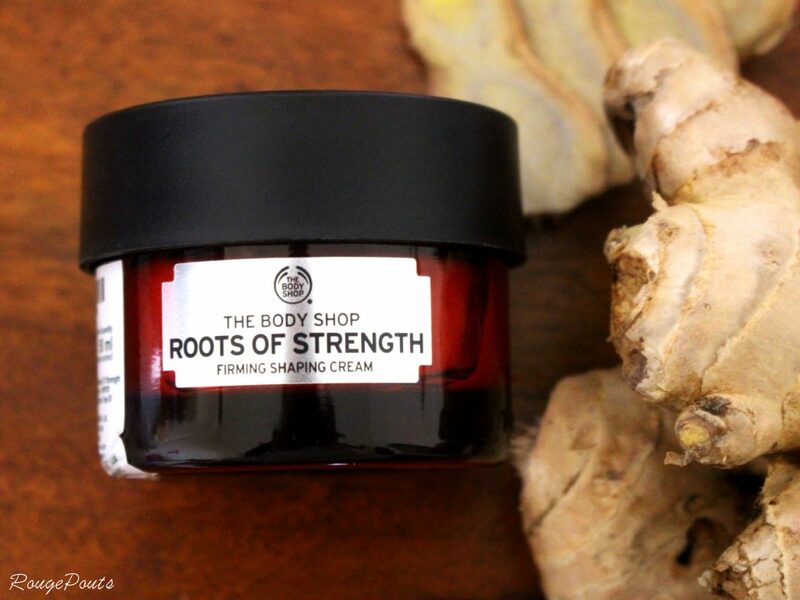 It’s called The Body Shop Roots of Strength Collection. The collection targets women between the age group of 45 – 60 years. In this collection, they have introduced a complete Firming and Shaping Routine. The brand doesn’t believe in age. According to them “We never get any younger, but we can look better and fresher with age.” and to that, I completely agree! 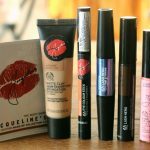 I had gifted this collection to my mother and she had been using these products for quite a while now. 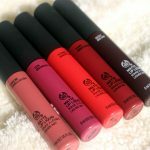 Today, I am going to write a review of these products based on my observations and her experience. The collection has three products. 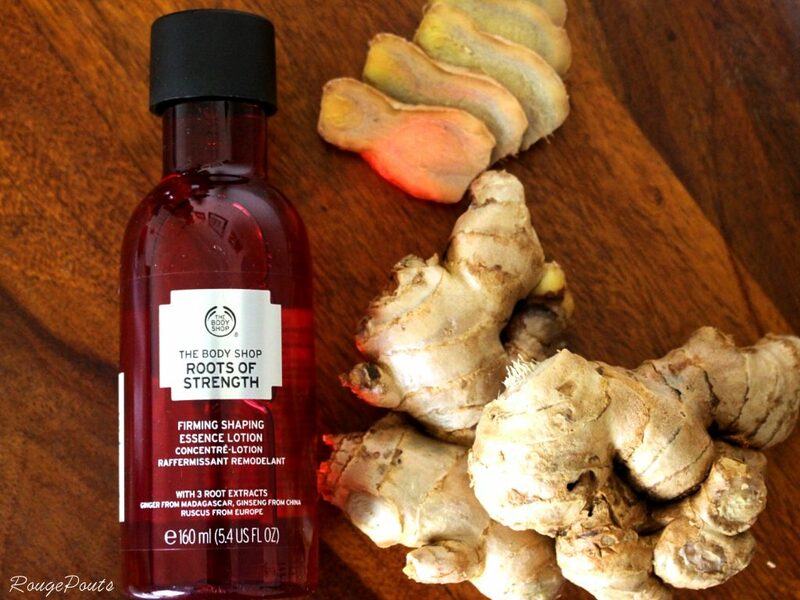 The Body Shop Roots of Strength Firming Shaping Essence Lotion, The Body Shop Roots of Strength Firming Shaping Serum and The Body Shop Roots of Strength Firming Shaping Cream. These three makes an entire skincare routine. 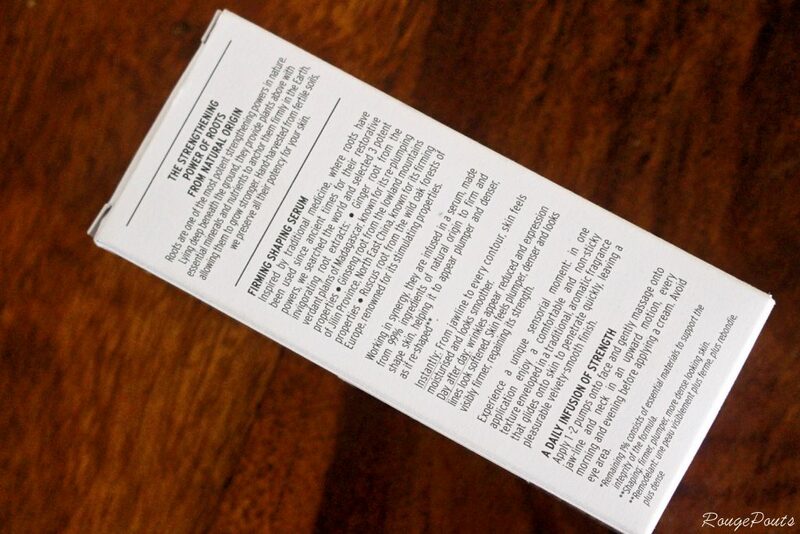 The products come in deep red packaging. The bottles of the essence lotion and serum and the jar of the cream are all red in color and their caps are black. The containers are packed inside a box which is completely white in color with just a shiny red patch with the name of the brand and the collection. The color codes help us identify the collection just like the other two – Drops of Youth and Oils of Life. The bottle and jar follow the same pattern but different colors depicting the collection and still they look pretty attractive. 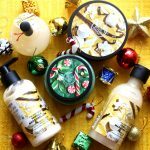 The essence lotion bottle is of plastic and the serum bottle and cream jar are made of glass. The quality is great and they all are sturdy and recyclable. 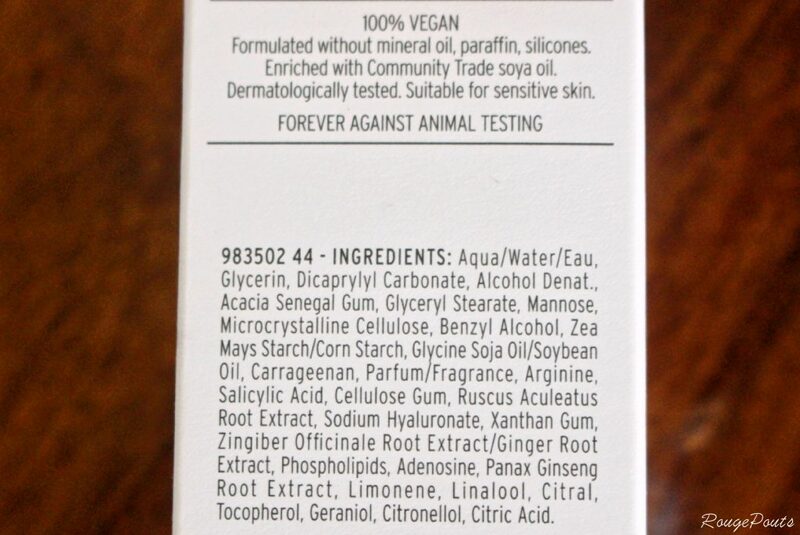 Ingredients – Please refer to pictures below. 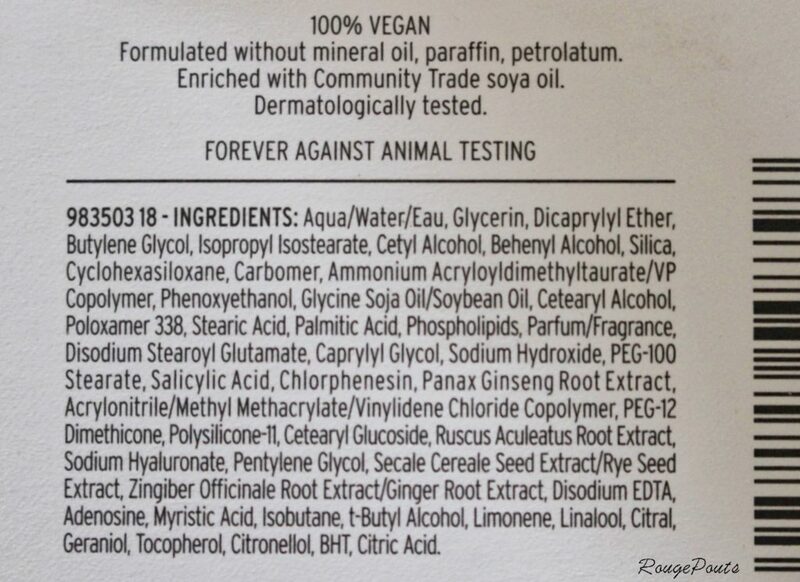 The Products are 100% Vegan with No Mineral Oil, Paraffin or Petrolatum! 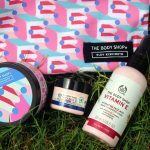 My Observations and Thoughts about The Body Shop Roots of Strength Collection! 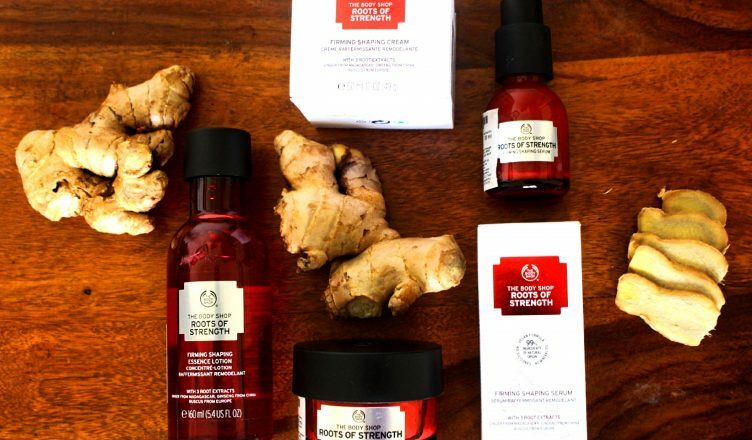 The Roots of Strength collection can also be called as Firming and Shaping Collection which consists of three major potent plant roots extract – Ginger Root Extract, Ginseng Root Extract and Ruscus Root Extract. 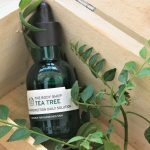 The Chinese have been using roots to look after their skin for centuries. 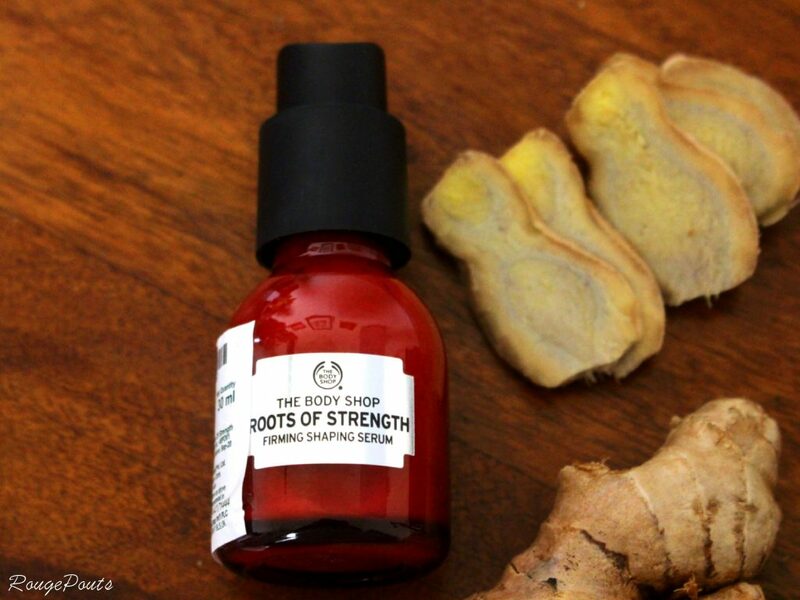 Like the natural roots used to boost immunity in Chinese medicine, Roots of Strength is infused with three powerful plant roots to help restore skin’s strength and shape; Ginger, Ginseng and Ruscus root. Let’s take them one by one. 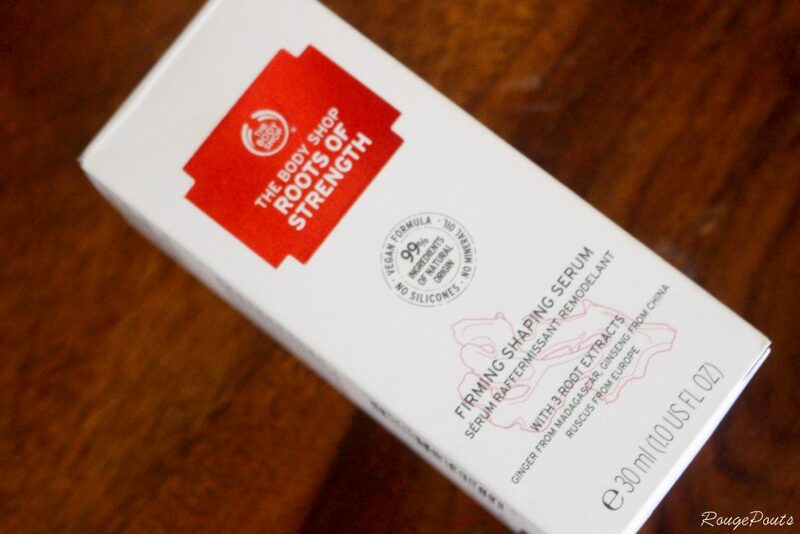 The Body Shop Roots of Strength Firming Shaping Essence Lotion – The first product to be used in the firming and shaping routine is this one. It should be used right after cleansing your face. 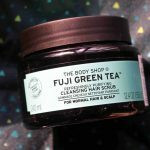 This product kind of preps your skin for the next two products by activating the skin while making it feel fresh and yet moisturized. 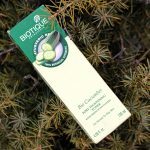 It is mainly colorless and feels like oil infused water which has a typical medicinal or herbal scent. The scent is not bothering, in fact, it’s very soothing. The product gets absorbed almost immediately and my mother started to feel a little warm on her face after a few seconds of its application. 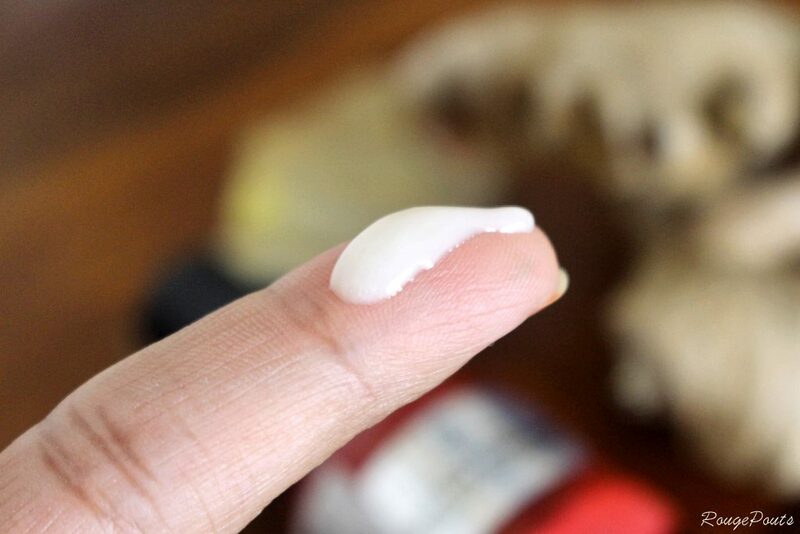 On her first impression, her skin felt moisturized with this product. 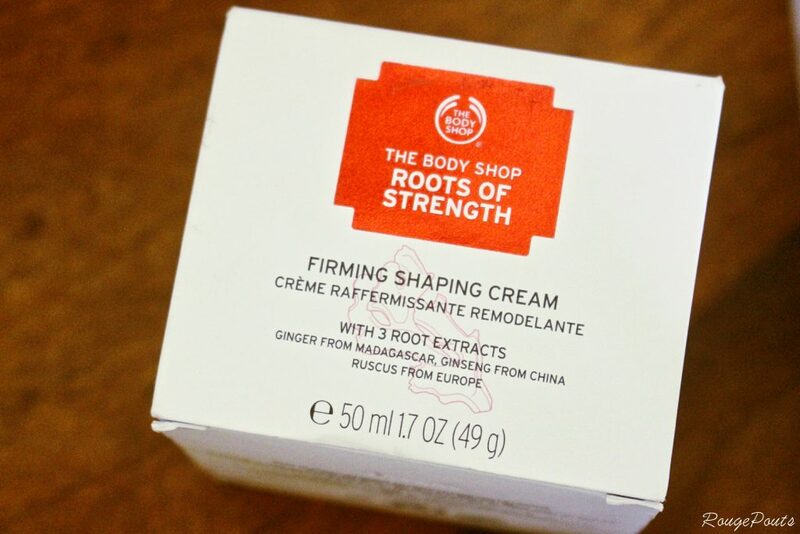 The Body Shop Roots of Strength Firming Shaping Cream – The last product in the firming and shaping routine is this cream. 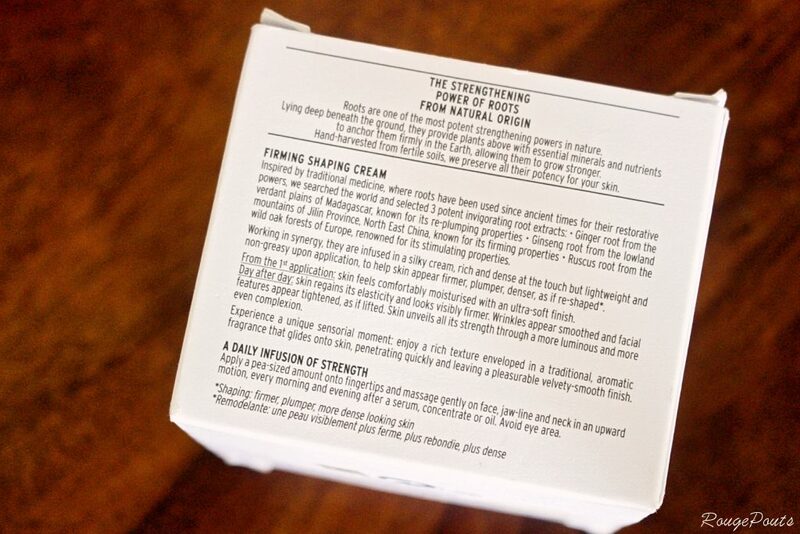 Infused with the same three potent root extracts of natural origin, the cream is the final touch to the routine. The cream looks pale/off-white in color and has the same medicinal or spicy scent to it. 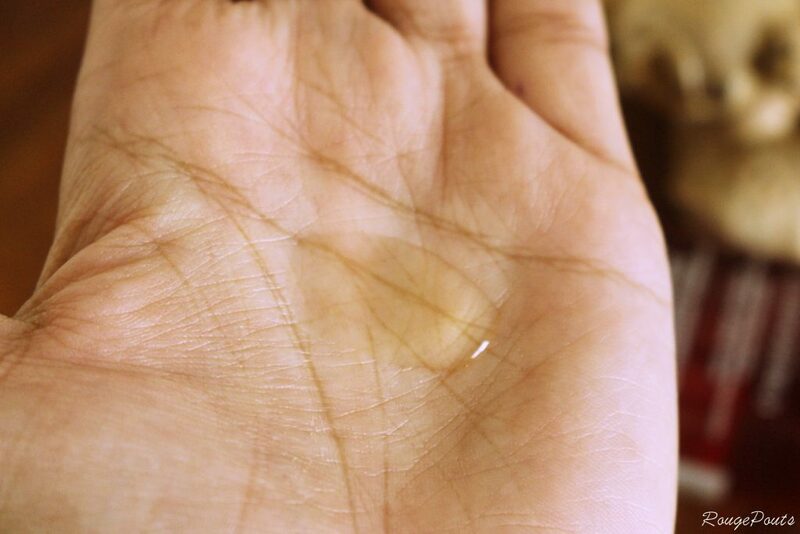 It appears to be very thick and rich and feels the same way when you touch it. 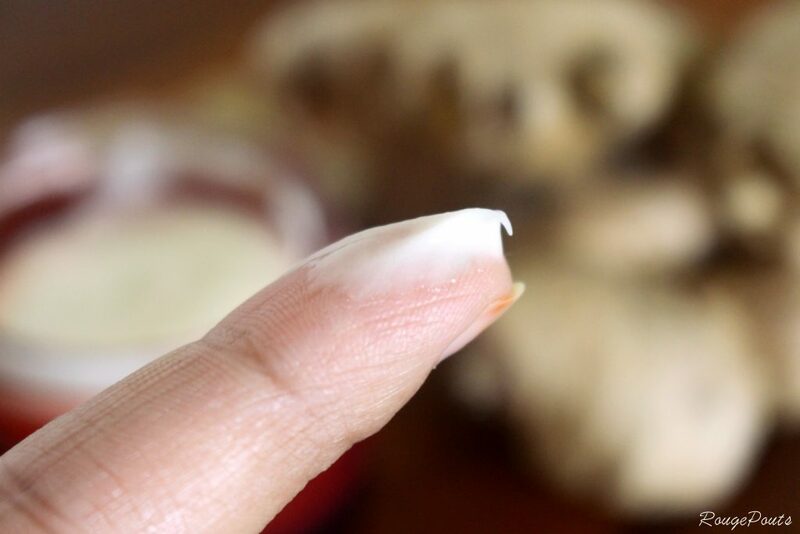 Take a pea-sized amount onto the fingertips and gently massage on your face, jawline and neck using upward motion as stated earlier. Avoid the eye area. 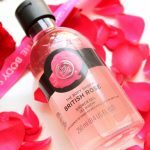 But the moment you start applying it on the skin it feels silky and a little lightweight. It spreads evenly and gets absorbed within a few seconds. 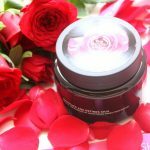 It certainly makes the skin feel super moisturized, soft and velvety smooth after the first application. However, after the application of all these three products my mother felt a little more sweaty and warm on the skin. She felt like the ingredients had some kind of warm effect on the skin which wasn’t bothering but you could certainly feel it. 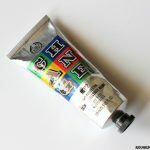 Having said that, the cream is not at all greasy! It doesn’t look greasy at all but feels slightly warm. 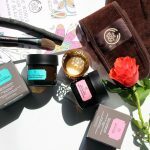 My mother’s first words after she used these products for the first time were “I feel so relaxed and pampered and I feel the products are working!” No doubt she felt that because the products’ feel is luxurious and nourishing and they are so rich that the skin feels softer, smoother and nourished instantly! Even though she could not have any miraculous difference the next morning, she did have a lovely glow on her skin. Her skin looked healthy and well nourished. Day by day, her skin’s texture and appearance improved. However, on the days she was stressed or tired the skin didn’t look as great but after 3-4 weeks her skin looked way better overall. 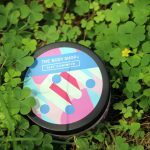 It felt as if her skin was firmer, plumped and the elasticity was improved! The appearance of her laugh lines and wrinkles around the jawline was better. Of course, they didn’t disappear but there was a slight positive difference which one can notice. I am sure after a few more months, her skin’s overall elasticity and health will improve and so will the appearance of her wrinkles. I am really impressed with these products and I would certainly highly recommend these to all the women in the age group of 45 – 60 years. It’s an investment in a better-looking skin. She would have a more strengthened, plumper, smoother and firmer skin. We can’t stop the aging but we can always look better with that age, or let’s say, age gracefully and beautifully!! I really hope you all liked this post and found it informative! I will come back with a new one soon! Have a great day! B-Bye!! 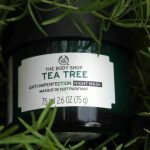 The Body Shop Tea Tree Wash.Scrub.Mask Review and Swatch! 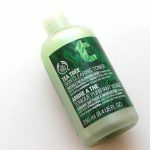 The Body Shop Tea Tree Anti-Imperfection Daily Solution Review! 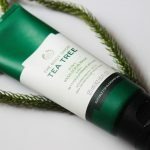 The Body Shop Tea Skin Clearing Tree Toner Review! 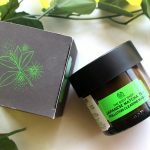 The Body Shop Hemp Hand Protector Review and Swatch!